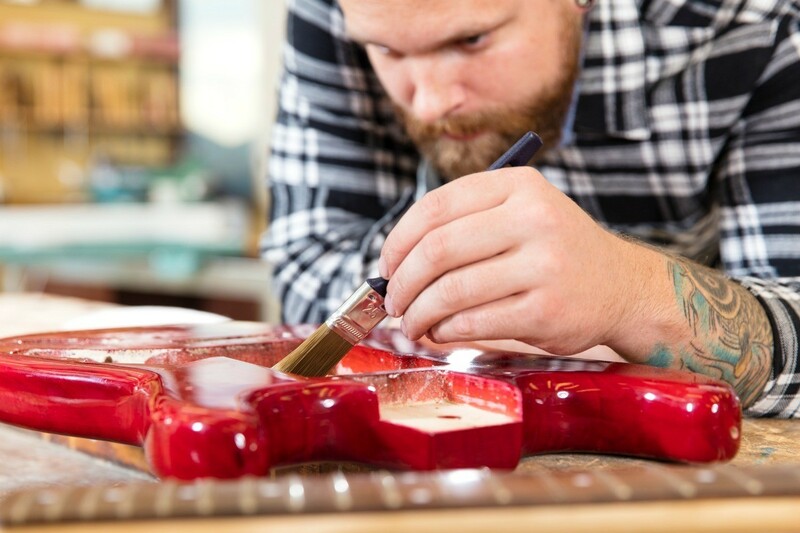 Add a personal touch to the instrument of your favorite rocker. This is a guide about painting an electric guitar. I have an electric guitar that is in good shape but the paint is worn in several areas. Does anyone know what type of paint to use or have any tips for painting an electric guitar? I am about to begin a guitar kit from grizzly. I know quite a bit about guitars but still I'm flying by the seat of my pants. One thing I have heard from a lot of sources that top guitar builders (Fender, Gibson) use nitro cellulose lacquer to paint the instrument. Supposedly that's a good way trick to improve sound. I just ordered some from www.stew-mac.com. The part I am unsure about is what to do if you want a solid color finish because if you were to use car paint which is enamel the lacquer clear coat would eat it. Stew-mac has lacquer pigment so I bought white. I want to do a metallic white finish does anyone know if there's a special kind of metallic dust for lacquer paints? I do know when doing guitars they say to on put enough color on to just cover the wood. Then clear coat for 5-10 coats. The last ones are the thinnest. Stew-mac has a lot of good references, check it out. Perhaps you could buff the worn areas with fine sandpaper and gently touch up with model paint or auto touch up paint. My observation has been this. REAL guitar players treasure their old, scratched, dinged, scraped guitars just as they are.......and their music is sweet and full and real! Then there are POSERS with the newest, slickest, shiniest, prettiest guitars. Their music is stiff and harsh with no soul! If it were mine I wouldn't paint it........I'd just play it! oh you make me wanna cry....don't paint it.